Unknown. Thought to inhibit cyclo-oxygenase, an enzyme needed for prostaglandin synthesis. Adults: 50 mg P.O. t.i.d. until pain is tolerable; then reduce dosage rapidly and, finally, discontinue drug. Don't give sustained-release form. Adults: 75 to 150 mg P.O. 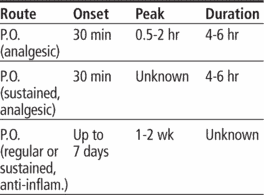 daily in three or four divided doses. Discontinue once inflammation is controlled. • children ages 14 and younger (efficacy not established). • Give with food, full glass of water, or antacids to reduce GI upset. • Don't open or crush capsules. • For arthritis, give up to 100 mg of daily dose at bedtime as needed to reduce nighttime pain and morning stiffness. • Don't give sustained-release form to patients with gouty arthritis. • Assess for dizziness, drowsiness, headache, fatigue, and exacerbation of depression, epilepsy, or parkinsonism. • Monitor for drug efficacy, indicated by improved joint mobility, pain relief, and decreased inflammation. • Monitor urine output for marked reduction. • Watch for signs and symptoms of GI bleeding and ulcers. • Tell patient to take with food, full glass of water, or antacid to reduce GI upset. • Advise patient not to open or crush capsules. • Inform breastfeeding patient that indomethacin enters breast milk and may cause seizures in infant. Advise her to use a different infant feeding method during therapy. • Caution patient to avoid driving and other hazardous activities until he knows how drug affects concentration, balance, and alertness. A brand name for INDOMETHACIN (indometacin).